Presbyterian Homes of Georgia has submitted plans to the Oconee County Planning Department that would shift its approved residential retirement facility from the commercial area of Butler's Crossing outside Watkinsville to a residential area on Rocky Branch Road. The nonprofit corporation from Quitman plans to build a $77 million Continuing Care Retirement Facility that would include cottages, villas, an apartment building, a health services center and a support building on the south side of Rocky Branch Road next door to a phase of the Rowan Oak gated community and across from Old Waverly subdivision. The PHG facility would be on a 96-acre tract rezoned in 1997 for the Autumn Glen subdivision. 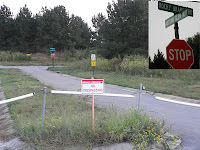 Though streets and some other infrastructure were built on the site, no homes were constructed, and the site currently is closed to the public with a cable stretched across its entrance. PHG is seeking to rezone the land from its current R-1 status to R-3 and to get a variance from the county Unified Development Code so it can construct two buildings higher than the allowed 40-feet. The proposed apartment building is to be three stories tall and stand at 42 feet, 8 inches in height, and the proposed Health Services Center also is to be three stories tall and stand at 47 feet high. Both will have pitched roofs, with the roof of the Health Services Center containing the heating and air-conditioning units. The county submitted documents to the Northeast Georgia Regional Commission last week for its review of the proposal. Oconee County Planner Brad Callender told me on Wednesday that he expects the NEGRC review to take 30 days or less and that the rezone request is scheduled to be before the Oconee County Planning Commission on Nov. 19. The rezone and variance request now is scheduled to be before the Board of Commissioners on Dec. 4, he said. The Planning Commission does not evaluate variance requests. Opposition to the rezone already has developed, with a web site arguing that rezone would negatively impact the existing neighborhoods and an online petition to the Board of Commissioners. Although PHG sought and received an Office-Institutional-Professional rezone for the property at Limmerick Drive off Experiment Station Road for a larger and more expensive proposal back in May of 2008, it is seeking the R-3 designation this time around. According to the County’s Unified Development Code, R-3 districts are for multi-family, medium density suburban residential development. But a Continuing Care Retirement Community is allowed if approved by the Board of Commissioners as a Special Use. PHG labels the proposed Presbyterian Village as a Continuing Care Retirement Community, as it did in 2008. CCRC’s are allowed “by right,” that is, without a special use designation, in an OIP district. The R-3 designation is permitted only with the approval of the Oconee County Utility Department, according to the UDC. Utility Department Director Chris Thomas wrote a letter to Edward Lane of Smith Planning Group, representing PHG, on Aug. 31, 2012, indicating that 62,906 gallons per day of water and sewer capacity “is available” for the location, officially at 2660 Rocky Branch Road. Thomas told me on Thursday that the Board of Commissioners had designated PHG as an industrial user with the 2007 OIP rezone and that his decision in granting the capacity this year for the R-3 rezone request reflected that earlier classification. On Aug. 16, 2007, he wrote a letter to PHG indicating that he was granting 60,000 in sewer capacity for the proposed project near Butler’s Crossing. Thomas said on Thursday that PHG had not paid the capacity fee in 2007 and had not reserved the water and sewer use. Thomas told me that PHG would have three options to reach existing sewer lines. It could run lines to the Rowan Oak pump station, create a lift station of its own to pump sewage to the pump station at Mars Hill Road, or create its own sewer line to go directly to the county’s land application sewage site on Rocky Branch Road near North Oconee High School. Regardless of how the sewage from the PHG is pumped, it would be treated at the Rocky Branch site, Thomas said. The county’s only other sewage treatment facility is on a tributary to Calls Creek outside Watkinsville. The Autumn Glen site backs up to Barber Creek, and the LAS site is on a tributary to Barber Creek upstream from the unsuccessful residential development. The condominiums and some, but not all, of the other units in Rowan are served by residential sewers. The community is a master plan development, a special designation that required sewer services. The county had been encouraging this type of development prior to the 2008 change in policy on sewer capacity. According to the narrative for the rezone proposal submitted to the Planning Department, PHG plans to retrofit the existing streets and utilities in the undeveloped Autumn Glen for the new facility. The Continuing Care Retirement Community will include a Health Services Center with three level of care: memory supported, assisted living and skilled nursing. This is in one of the three-story buildings. This “is a state of art facility designed to address the specific health needs of residents with Alzheimer’s and other memory challenges,” the narrative states. A two-story Village Center will include a main kitchen and dining facility, fitness center, physical therapy center, indoor pool, library, chapel, meetings rooms, auditorium, hair salon, arts and crafts center and administrative offices. Plans calls for 121 single-family cottages from 2,400 to 3,500 square feet of space. Some will have basements providing additional space. In addition, 18 two-family, attached units will be part of the facility. Each unit will be between 1,770 and 2,000 square feet in space. These single-family and two-family units will be owned by PHG, not the residents. The three-story independent living apartment building will contain 75 apartments, with one to three bedrooms. A support services building will be the headquarters for all mechanical and maintenance staff and equipment. A gate house at one of the two entrances on Rocky Branch Road will house security personnel. A pavilion will be used for social and recreational opportunities and will be adjacent to amenity features such as tennis courts, a putting green and walking trails. The project will be completed in phases, with the initial phase including the Village Center, the Health Services Center and 50 residential units composed of a mixture of cottages, villas and apartments. The narrative says these will be open in 2018. “The remainder of the development will be constructed as dictated by demand with an estimated time to build-out lasting to 2028,” the document states. The narrative for the rezone the BOC approved for PHG on May 6, 2008, proposed a two-story Health Services Center, a one-story memory support center, and a two-story village center. It also included a four-story apartment building with 150 units and two levels of parking below ground. The original proposal called for 41 single-family cottages and 20 two-family cottages. The total project cost was estimated at $115 million. The project was to be on 55 acres of land carved from larger tracts owned by KBB LLC and usually referred to locally as the Bishop property. The project included an extension of Bishop Farms Parkway and an interchange on U.S. 441 Bypass. According to the proposal, the site was attractive because of the access to Experiment Station Road and U.S. 441 and its proximity to the neighboring Gainesville State College and University of Georgia campus in Athens. The proposal also cited the easy access to “historic downtown Watkinsville, as well as banks, grocery stores, pharmacies, restaurants and the Regional First Care clinic.” The clinic, and these other facilities, are in Butler’s Crossing. Though the land was rezoned as requested by PHG, it did not change hands. It remains listed in the Oconee County tax records as the property of KBB LLC. Kay Shepard of 1111 Limmerick Drive is listed as the contact person. While the proposal for the Rocky Branch rezone also lists its proximity to UGA and to “banks, grocery stores, pharmacies, restaurants and health-care facilities,” most of those are in Butler’s Crossing. Callender, the Oconee County planner, told me the county already has three sites in addition to the KBB property zoned for a Continuing Care Retirement Community but not developed. One is in Butler’s Crossing across from Stonebridge subdivision. One is on U.S. 78, and the third is on Mars Hill Road at Virgil Langford Road. The Wright Land Company had sought the rezone of the 96 acres on Rocky Branch Road for Autumn Glen in 1996. The rezone wasn’t approved until July 1, 2007. In January of 2007, the land was transferred to Autumn Glen LLC. According to the Georgia Department of State Corporate records database, J.L. Wright is CEO and Rod Wright is CFO of Wright Land Company, whose offices are at 598 S. Milledge Avenue in Athens. Rod Wright is the registered agent for Autumn Glen LLC at the same address. The rezone ordinance passed by the county set the maximum number of lots on the 96-acre parcel at 87. The submitted plan showed two entrances onto Rocky Branch Road. Tax records list the property as two separate tracts, with a combined value at just less than $1 million. The two undeveloped tracts to the west of the Autumn Glen property are owned by Weaver-Dover Land Group LLLP. Combined they are 106 acres and are currently zoned agriculture. Georgia Corporate records list James Weaver Jr. of Athens and James Weaver III of Atlanta as partners. Presbyterian Homes of Georgia, founded in 1949, holds non-profit status but is not formally associated with the Presbyterian Church. Frank H. McElroy is the CEO, and Dianne Arrendale is the CFO. In the state corporate database, both list 301 E. Screven Street in Quitman as their contact address. Quitman is in Brooks County on the Florida border. McElroy is an officer in nine corporations, according to the state database, including Calvin Court in Atlanta, Philips Tower in Decatur, Westminster Presbyterian Homes, Presbyterian Village in Austell, and Presbyterian Home in Quitman. All of these are nonprofits. McElroy also is CEO of Residential Rental Properties Inc. of Quitman. Arrendale is the CFO. The PHG web site lists the Oconee County project as under development. The Oconee County submission to the Northeast Georgia Regional Commission contains only basic information about the rezone application. Total building area is listed as 690,100 square feet, with 232 total dwelling units. In 2008, the regional commission also examined the PHG rezone application and found it "warrants regional review." Callender said it should be possible for citizens to offer comments to NEGRC. The organization’s web site lists a variety of contacts.